After about thirty minutes, though, I settled into “Shakespeare mode” and managed to follow along. I still kept my book out to make sure I was on track. This adaptation rearranges some of the scenes, which is normal for a Shakespeare adaptation; I thought that the rearrangement actually helped the story make more sense. I had the same feelings during this adaptation that I had when I read the play. I didn’t find Falstaff as funny as some people do, and I still had a hard time sympathizing with Prince Hal. I will say that this version did a really good job at showing his “reformation” through a lot of visual symbolism. 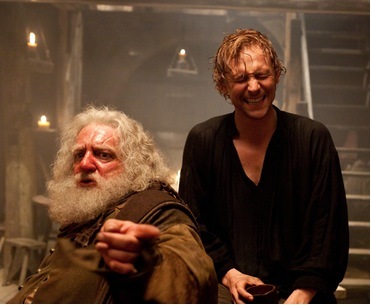 Falstaff (Simon Russell Beale) and Prince Hal (Tom Hiddleston). I also really enjoyed the scenes featuring Jeremy Irons as King Henry IV. He did a really nice job of showing how his questionable ascent to the throne affected his reign. He also was incredible in the scene where he confronts Hal about his wayward behavior. Even though he’s the title character of the play, he’s not the main character–I wish he had been more of the focus. 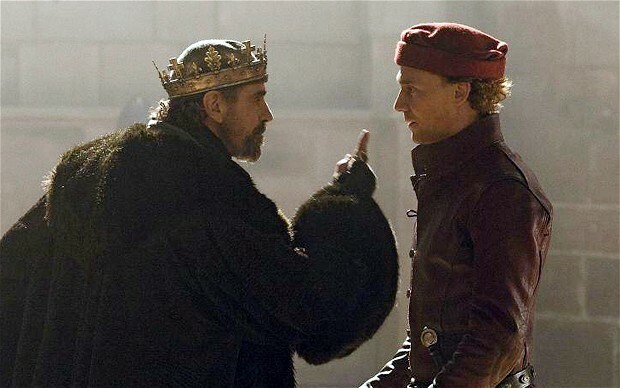 Henry IV (Jeremy Irons) reprimands Prince Hal (Tom Hiddleston). The other part of this adaptation that I really enjoyed was the role of Henry Percy, “Hotspur.” While it was really difficult to follow the beginning of the play, Joe Armstrong did a fantastic job! I thought this Hotspur was the perfect rebel, and his wife just happens to be one of my favorites from Downton Abbey! Hotspur (Joe Armstrong) and his wife (Michelle Dockery). I’m excited to see how these actors reprise their roles in Part II.